Yes! The revolution to overthrow President Rodrigo R. Duterte is under way thanks to the Automatic Protest Machines. As the protests for Leila Dilemma and against the martial law in Marawi against the Matae terrorists dwindle, Smartmatic comes up with a new solution. For years, they have been anticipating events where you lack support. Now Smartmatic comes up with a new solution. Antonio Mugica Rivero of Smartmatic joined brains with Lewis to come up with the Automatic Protest Machine. This was revealed through #LoidaLeaks. It was revealed that a lack of support for the Liberal Party forced Smartmatic to create the Automatic Protest Machine. The robot itself is designed to protest for the Liberal Party. A new memory card was customized to protest in favor only for Liberal Party candidates and support the Liberal Party. The leaks were revealed that the Automatic Protest Machines are designed to help overthrow Philippine President Rodrigo R. Duterte. More plans were revealed as the Pisonets in Tondo and imprisoned CHR Vice Chairman Filipo D. Hippo's laptop reveal the Automatic Protest Plan. 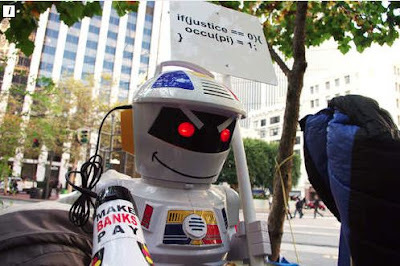 These robots called Automatic Protest Machines are revealed to contain a hacking signal that will artificially increase protests. These robots will be installed in certain institutions that favor the Aquinos such as the Commission on Human Rights, Ateneo De Manila and the University of the Philippines. The robots will help convince Filipinos that the nation is still in support of the Liberal Party. Whether or not the Automatic Protest Machine is fully functional is yet to be seen. Allegedly, the blueprints for the machine were retrieved by Justice Secretary Vitaliano N. Aguirre II and Senator Panfilo Lacson. Details of how this plot will develop will come underway.